Yesterday I watched the Monaco Grand Prix F1 race from start to finish. I had never really paid much attention to F1 racing before, and this was quite the dramatic race. Check out the highlights if you missed it. Monaco is the track that comes with the board game Formula D. I’m such a big fan of the game I own all the expansions which include F1 tracks from around the world. The game is a lot of fun in its own right, but some games can turn to run away victories with a few fortunate rolls of the gear dice. This got me thinking about other racing games I love, like Super MarioKart. If you are looking to add another layer of excitement, and to add some randomness and equalizers to the race, just add Mario Kart items! For the uninitiated, in MarioKart when your Kart runs over a question mark box, you get an item that can help you in the race. 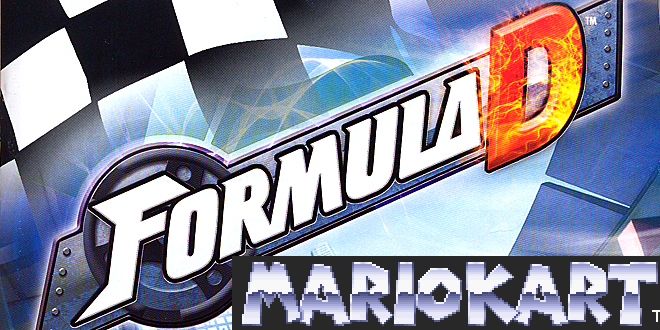 At this point there have been a lot of MarioKart games, and with them a lot of different items with different effects. Some would be more difficult to simulate in a board game than others. Here are my suggestions. Use the red debris markers to simulate the the boxes, adding one per player. For a one lap game, I would suggest adding them half-way through the lap, for a two lap game, I would add them just before the finish line, or in both places if you want a lot of items! Once a car runs over the box, that player rolls the standard d20 “danger die” to determine what item is received. I’ve mixed and matched items from several different versions of MarioKart to make the mechanics easier to handle. I’ve borrowed a few mechanics from 5th Edition D&D for the shells. While the game comes with one standard d20, I would recommend adding a few more to the box if you’ve got a few lying around (and if you’re nerdy enough to be reading this, you probably do!). For green shells its just a simple contested roll: both attacker and defender roll a d20, if the attacker has the higher result, the shell hits and the defender spins out. If the defender has the higher result, the shell misses! Red shells work the same, except the attacker rolls 2d20 (advantage in 5th ed. terms) while the defender still only rolls 1d20. Highest result wins, if its the defender, the red shell misses! Download the full table here. I hope you guys enjoy this expansion to the rules. Watch out for blue shells! Mike and I attended GaryCon VII (2015) together, and had an incredible time. While I bought up just about everything I didn’t already own that Goodman Games has released, Mike had the forethought to take one look at the rack of zines available, and pick up one of each. Since then, he got in on the Zine Vault kickstarter and recently lent me his collection to become more familiar with the medium. 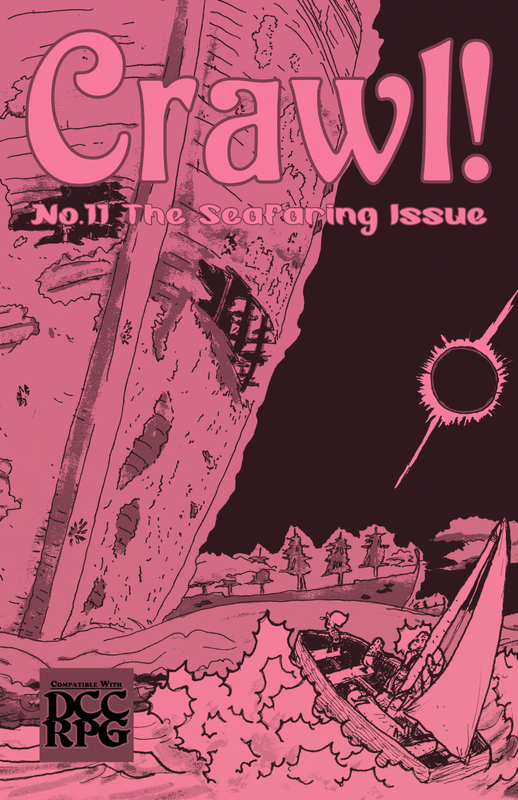 I have paged through several, but Crawl #11 caught my eye and I read it cover to cover. 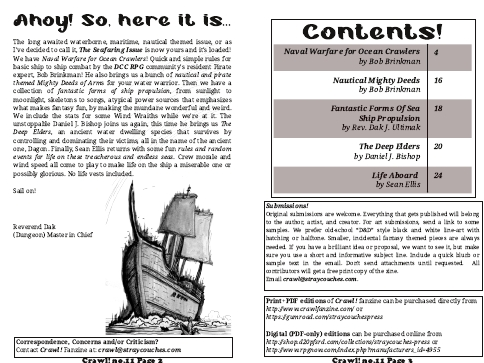 Included are rules for naval warfare and nautical mighty deeds by Bob Brinkman, Fantastic Forms of Sea Ship Propulsion by the DCC editor (and Crawl! creator) Rev. Dak J. Ultimak, The Deep Elders by Daniel J. Bishop, and Life Aboard by Sean Ellis. The last big pirate RPG I had played was the Pathfinder adventure path Skulls and Shackles. This (like most of my Pathfinder experiences) started really well, but got a little ludicrous as the story progressed. In contrast, Bob’s rules about ships, cannons, and alternative weapons like chain shot and greek fire provide a canvas on which a flavorful, action-packed adventure could be painted! These rules hit all the right notes without getting too bogged down in mechanics. Tables for both crits or fumbles with cannons and fire-throwers ensure the need for the last table: brutal injuries! Also included are brief descriptions of special maneuvers such as boarding, crossing the T (coming across the bow and firing), as well as ramming. The naval mighty deeds are the icing on the cake, and include tables for boarding, cannon shots, and general piracy. Fantastic Forms of Ship Propulsion detail eight alternative forms of naval locomotion. These range from the sun and stars, to creatures acting as the motor such as turtles and eels. My favorite is the skeleton crew, which is literally a necromancer’s ship with skeletons at the oars. Each include possible complications of the alternative power sources. These could work well on the Purple Planet, or any sea adventure that needs an interesting twist. If you are looking to add some elder god flavor to your next oceanic excursion, The Deep Elders describe starfish like servants of Dagon that glow with blue, green or yellow light and possess sailors. Those enthralled become puppets of the deep elders and may only be banished with very strong magic. There are interesting rules about starting over as a 0-level and choosing an alternate, or gaining levels of your demi-human class once possessed. Sean Ellis writes Life Aboard, which is a great set of tables to simulate days or weeks at sea. The Ship Morale table affects the subsequent Wind Speed and On-board Events tables, as the crew is either motivated (or not) to get the most out of the ship and the winds that day. The events are well thought out, but include the use of a d18, which is not part of the standard DCC chain. I love weird dice more than most, but even I draw the line somewhere. Since both 1 and 18 are non-events, you could substitute a d16 for a lively journey, or a d20 to include more non-event days. Overall, this is an outstanding value in either print or PDF form. Since this issue is focused around this one theme, if you are looking to run a nautical adventure using DCC, Crawl! 11 is an outstanding resource. Even if you hadn’t considered it before, I bet you are now. Great work! A few weeks back, I was roped into trying my hand at running a session of the Fantasy Flight RPG Star Wars “Edge of Empire” at the local Bounty Hunter’s Guild at The Wyvern’s Tale in Asheville, North Carolina. 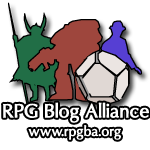 It’s a weekly (or semi-weekly) “drop in” game that Kevin has posted about before, and since I had played several games figured I would step up and try my hand at GMing. It was a complete blast! I am normally a person who preps like crazy. As noted before, I have a penchant for making detailed binders for trips and for campaigns. The story-telling nature of the typical Star Wars game, however, doesn’t lend itself to my normal GM style. Stepping way outside of my comfort zone, I came up with a basic premise with three “scenes” to make the entire game. First up, an alien xeno-archaeologist (with a bounty on his head) discovers a hidden temple and needs rescue; there’s unique environmental effects which cause havoc (and preclude the use of the bounty hunter’s overpowered normal transport) and causes their ship to crash to the planet’s surface; and at last a big scary beast to scare the bounty hunters off. For the first part, I decided to make the alien a Brizzit and that he would have a protocol droid translator who was demolished. The temple he was hiding out in was dedicated to the Sith, and there would be a Sith or Sith-spirit present. The second part would be the planet itself: heavy electrical storms in the high altitude meant that any vehicle without specialty shielding would almost certainly crash (luckily the Bounty Hunter’s patron had just such a ship); and finally, for the third scene I’d have to create a creature loosely based on the Krayt dragon, but capable of flying for the final battle, followed by rescue from another ship. I tried to play it fast and loose. I figured the first scene would be a combo: quick RP interaction with the Hutt boss and outline of the mission followed by a piloting / mechanics check scenario as they try to navigate the horrific lightning storm. Right from the get-go that didn’t go according to plan. With a double-Triumph and setback dies removed from the check due to some crazy co-pilot talents, the ship sailed down with minor damage, enough that I ruled there was a hull breach and they’d need to set down for repairs. The second scene was originally supposed to be interaction with the alien (who did not speak Basic) and repairs to the protocol droid, and that went as planned for the most part. We didn’t have a real ‘face’ character so without too much misunderstanding the repairs were effected and the Brizzit convinced the group to take cover from the approaching storm in the temple itself. This is the point at which having tried to plan on every contingency would have been a very bad mistake. The original idea was to very cinematically have the Sith Master drop in front of the hole made by blasting through the wall, threatening the PCs and then being swallowed (fancy red lightsaber and all) by the humongous “dragon” and the smaller ones (still quite dangerous) leaping in to attack. Of course, two of the PCs got first attack and one of them rolled a Triumph (again!) to shoot the lightsaber out of his hands and the other one did some crazy maneuvering to roll around and grab it. At this point, things are very much off the rails. 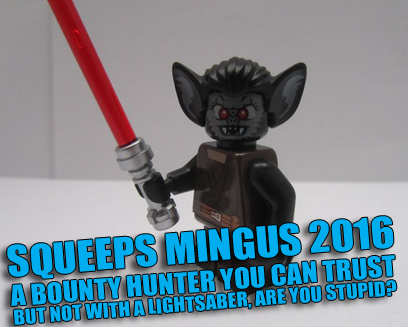 A Chadra-fan mechanic skill monkey with a lightsaber can just about ruin any campaign, so I had to think fast. Additional fire from the high-powered assassin droid and several rounds of crits from the Bounty Hunters rocked the Sith back on his heels and it was only a matter of time before he fell. Now I felt it was time to panic. I knew I’d have to get that away from them somehow, and then it hit me: this was the “treasure” the Brizzit and his no-good protocol droid were after the whole time! I played up the fact that the storm wouldn’t be abating for several hours and they were in for a long repair session, but afterwards they’d be good to go. With a few nudges about how exhausted they were, everyone played right into my hands by putting the assassin droid as “guard” while the rest of the crew napped. One restraining bolt later and the “xeno-archaeologist” steals the lightsaber off the sleepy Chadra-fan and runs out into the storm to “escape” while the droid fought everyone who was waking up. Cue the music and it’s the other bad guy who gets scooped up by the big “dragon”(along with that saber)… and everything from there continued more or less as planned. They killed the big thing (again thanks to a lot of crits), got the ship up and out of the storm and away back to home base. They had to explain why their bounty was dead and the ship had a hole and they really had nothing to offer beyond the location of an old Sith temple. The Hutt (and by extension me) took some pity on them, swore them to secrecy saying he may have a buyer for that sort of information (and a potential plot hook for another game). All in all, I had a great time with a low-prep way of running and everyone seemed to have a good time. The game lends itself to a different style of GMing than I am used to and I really enjoyed it when all is said and done. Kevin pointed out that only I could make a Star Wars game with space wizards and thunder dragons. Rightly so. Her background occupation was fortune-teller and she had a tarot deck as one of her pieces of equipment. We had a printed copy of the Deck of Many Things, so I grabbed that and whenever someone questioned Sister Aramella or wanted me to cast a spell, I pulled a card and wove that into my role-play. 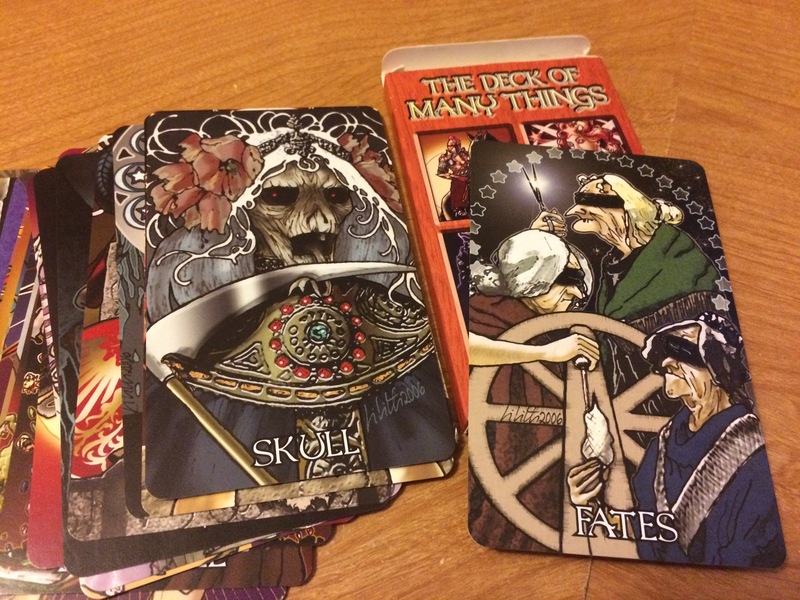 We faced an enemy: I pulled a card – “Death” – and said “Well this does not look good…” It was a great hook and the spell Second Sight got the most use out of any previous DCC game because I’d pass the deck to the GM and he’d arrange for me to pull a card and let me interpret it as I saw fit. “Oh you’d like healing?” Pull out the Skull and “Sorry, the Fates decree that you might not survive the day. We’ll see.” Botched a spell? Pull out the Idiot card and cry that my actions have upset the Triplicate Goddess. One of the things I would like to add more of to my own DCC games are additional patrons, and additional spells or effects like I described. The 2015 Gongfarmer’s Almanac (available at the Google+ DCC community for free and now in an omnibus addition) has a whole slew of new patrons and even a great chart for additional daily effects expanding upon the birth augur in the core rulebook. What sort of props have you added in to your DCC games? What kind of patrons or additional effects would you like to see? Comments are open!